Visit The Undefeated website to purchase tickets online, or call 888-AMC-4FUN. Tune-in to Bristol Palin’s EXCLUSIVE interview on Dr. Drew tonight! Tonight Dr. Drew sits down for a one-on-one exclusive interview with teen mother and celebrity Bristol Palin. Dr. Drew and Bristol will discuss what she calls the biggest regret of her life, “It was a night that I look back on with the adult eyes I have now and I just realize, that was so stupid.” Bristol continued to say that adding alcohol into the mix didn’t help either. They also discussed her relationship with her mother, her “new” look and Bristol’s reaction to the latest information about her and her family released by Levi Johnston and the impact those revelations have had on her and her relationship with Levi now. And tune in to Dr. Drew’s primetime special interview with Bristol TONIGHT at 9 p.m. ET/PT on HLN! The latest YouGov Poll has Sarah Palin only one point behind putative leader Mitt Romney and, significantly, also ahead of current media darling Michele Bachman. 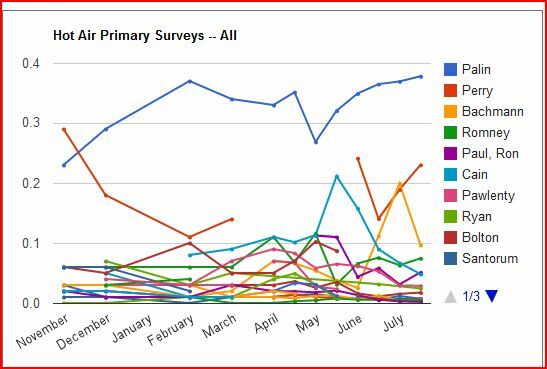 I twill be interesting to see the next poll as Bachman has had some headwinds in the last few days which have been reflected in the Hot Air poll result below. YouGov looks at the GOP possible candidates in another way and Palin and Bachman tie for the lead but-significantly Palin’s support is stronger amongst the non-Tea party element showing she can attract a wider audience and more than Bachman from the majority element in the party. If you had to choose one, which of these individuals would you want to be the Republican nominee for president in 2012? In the 6000 vote+ Hot Air Poll taken on July 4th Sarah Palin blitzed the field with 36.94% compared to rising media star Michele Bachman coming in a distant second on 19.95%. This poll is relevant as they have strict one person one vote guidelines and although most on line polls are suspect the Hot Air one seems the most stringent and is at the very least a guide to GOP voters thinking-which voters are after all the only ones who count in the nomination process. After some further weeks of intense media coverage of Bachman-which in latter days has been very negative as her history of her and her husband’s Gay unfriendly statements and revelations of her health issues plus the satirists cranking up have shown, once again, the rapid rise and fall of these media darlings. In the new poll out today of, again, 6000+ votes Palin has actually increased her lead to a stratospheric, given the amount of competitors in the poll, level of 38%. Bachman on the other hand has experienced a near 50% drop in her support to 10%-it must be somewhat amusing for Palin to watch these media darlings rise and fall whilst she contemplates running, on the current trends, if she does run, it appears that a classic left/right Palin/Romney showdown will determine the nominee. 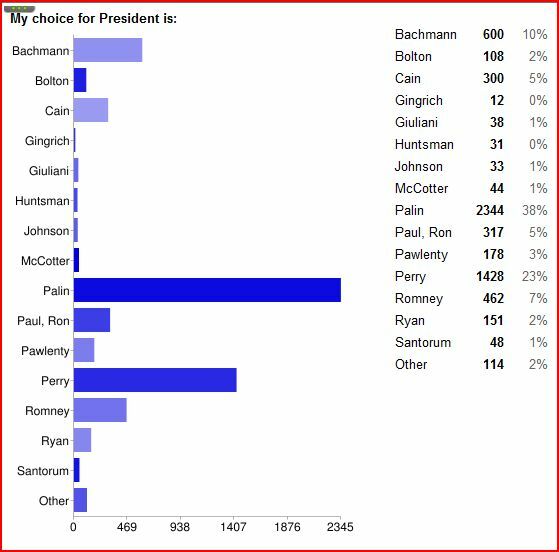 In a telling result the Palin/Bachman “head to head” result for the July 4th poll was Palin 52.18% and Bachman 47.80%. The new poll has it Palin 62% and Bachman 38% sic transit Bachman. As for Perry, the new, bright shiny media star he has gone up, albeit slightly to second place, but still way behind Palin. However, if he enters the race look for his quick ascent as the “anti-Romney” and “sensible alternative to Palin on the right” until he garners the close attention of the media. There is of course one potential candidate who will have no problems with media scrutiny and sensational revelations as everything that could possible be thrown at her has been done so and she is still standing and, with these who were polled, the preferred candidate-makes sense.